This is Circulating Ideas. I’m Steve Thomas. My guest today is Scott Bonner; he’s the Director of the Ferguson Municipal Public Library in Ferguson, Missouri. You can find him on Twitter @scottybonner. Before we get into what you are doing now, when I was looking over your bio and kind of stuff you have been doing you kind of remind me of kinda my journey, where you finished college in early 90s and then about a decade later got your library degree. What were you doing in the meantime, what was your job and stuff between, before you became a librarian? That first career was in mental health mostly working in lockdown facilities, working with children and adolescents for the most part. Some working with adults in lockdown and then a couple of years at the end I’m working as Intensive In-Home Case Manager which really means barely trained therapist with a car and occasional companion at court and doing school hearings and that kind of thing. What led you to librarianship? Well, I have always kind of bounced back and forth between helping kids and working in libraries and bookstores. So what became a fairly common pattern is we’d move to a new location at first I’d get a job in a bookstore and then I’d work my way over to working with kids, but there is a point at which after nine years in mental health at the ground level kind of mental health that I was doing most people didn’t last that long in that particular piece of the field, and for me I lasted longer than most but I think I also was going slightly mad and so I decided that I needed to have a job where I didn’t have fear for my safety, where no one had to worry about someone peeing on me, that kind of thing. So I got a job at Purdue as a Curator, I don’t remember what my title was, but I was the map Curator at Purdue’s GIS Library. And I thought, “Wow, this is really great!” So when I moved up to St. Louis in 2002 then we have gone to Indiana for my wife to go grad school. We moved at St. Louis in 2002 and got job at Wash U, I did that for couple of years and then I thought, “I really need to go and get my degree and actually make this a career and not the job that I’m doing now.” So I did stay-at-home with, we had our first son about that time or first kid. So I played stay-at-home dad by day and full-time library student by night between 2 and 4 AM everyday and I got my library degree and then I start working. Was that, sort of, wanting to work with children, wanting to work with people, is that what kind of led you to public libraries of wanting to work directly with the community like that? Yeah, I think so. A lot of people seem to think that librarianship is what you do you love books and that’s just not the case. I mean, loving books is very useful, it gives you a depth of knowledge for answering those questions, but it’s really about people and wanting to help people and the kind of helping it’s similar to mental health, maybe little as emotional a little less intense usually but it’s also one of the ways of helping people cope with the world and get along and do better. Your current job at Ferguson Public Library is your first directorship, is that correct? Yes, absolutely. Before this I worked about, I started as Director in July, July 1st. And before that I worked about seven years as the Adult Services Provider and Technology Librarian at Richmond Heights Memorial Library which also included making schedules and some discipline stuff and some paying the bills and that kind of stuff. So it allowed to me have kinda one toe in directorship throughout that time and before that I was, for a brief time, running the Julia Davis Branch of the St. Louis Public Library System which is a huge system, Julia Davis Branch is a wonderful branch with a great history. And I was kind of the number two there, I was in charge of the actual branch but there was the Regional Manager who also had an office in the building. So I had a boss right there I could questions and before that I was looking for a job for nine months. Yeah, yeah I knew what I was getting into. But I think part of my pitch that maybe helped me to get the job is—I know what I’m getting into. And it ended up being maybe all that and moreso but yeah I knew what I was getting into. There is a meta-question there—did I know the importance the library would play, no, because I was just busy jumping. And my thinking was not, “Hmm, what role shall we play?” But my thinking was, “What can we do? How much can we do? Is there a way to do more?” So retroactively sure I considered us to be an important part of this community before Mike Brown was shot. And I was working hard for that first month and a week before that incident to make contacts throughout the community, to let people know the library’s here, that we are gonna would be as open as we much as we can and all that good stuff. And when Mike Brown was killed it gave an opportunity to kind of kick into high gear and really do everything we can. Reading other things that you have done that your outreach to the community didn’t start with this situation that sort of I mean obviously ramped up quite a bit but you already trying to do this? Exactly, yeah, my philosophy was already I should be trying to do everything we can to put the library in at the center of the community and to make the library known to everyone in the community, to kind of get to know the community so I could kind of, like, target specialized library services toward the community. Part of the reason that I wanted to be a director of an independent library as opposed to a branch manager in a larger system or something like tha,t is because I really like the idea of the library that has a well defined community that it can truly cater to, right? That it can answer to and try to be responsive too as much as possible without having to make that a more diffuse effort across the larger chunk of ground you know what I mean? On my business cards, it says a library should perfectly fit its community because that’s one way of pitching what I’m talking about. When you decided, I think you said in the past that you did have to close one day because you had power outage or something like that? Exactly, and checking in and checking out and everything else. So I just waited there until closing time to see if the cable will come on or the internet will come on but it never. So we were closed all that day. During the initial protests, I think that the story that kinda came out into the larger media was, “Oh, the library just this safe oasis, everybody is safe, everybody is leaving it alone” and things like that. But you did have one incident where I think you said people tried to get in? Yeah, not in August. Well, first off, yeah, we try to be the safe oasis, I’m up every night into the wee hours and then I get up early in the morning and check the news and the Twitter feeds and check the live streams again, just to assess whether or not it’s gonna be safe to open, I don’t open library that’s how I think it’s gonna be safe because the first priority is making sure that patrons and the staff are safe, that being said it’s been safe, right. It’s safe enough for us to open and do our things. And in August nothing as far as I know came directly on the library property. You know, we had protests pushed past the library, the big crowd is coming through, events planned for right by our space and that kind of thing but nothing did actually touch the library necessarily like the building itself in this case. But when the grand jury decision was announced on Monday, this last Monday, week and change ago. That night we were open late which is our normal close time and after we closed if you, the staff and I watched the grand jury decision then the other two staff they are with me, they went out to I think to join the protest and I stayed here at the library with a fire extinguisher because there is been a history of a rogue element someone who is taking advantage of opportunities to set things on fire. And so I thought, “Well, I don’t wanna set our place on fire.” And I knew there was a possibility things will get ugly, I didn’t expect them to get ugly because I had confidence in the people but things did get ugly and we can go into detail about why and how and whatever, but in many cases they did get ugly, I was here with my little fire extinguisher. When the crowd suddenly bolted and whenever a big crowd gets together and there is a sudden, something happens and makes them all scared what happens is either a route or a riot when the crowd bolted out and started tearing up the street, coming past the library, there were two groups who in separate instances came to the library and tried to kick in the front door. And in both cases I just kinda ran around the corner from the inside with my fire extinguisher in one hand and said, “Go, go no, no not here.” And thankfully in both cases they went on to the next place, they yelled some insults, they try to knock the door couple of more times and they took off. And it sounds like, again, in the outer world the media is saying it’s like this, it’s like what they are showing on the news is happening all day long for months and it’s been happening since August and that’s been four months long. But as you said, especially during the day everything seems basically normal I mean people are talking about it but it’s basically normal. Exactly, if you are in the right part or if you are in the wrong part of town, the part where the protests are happening on the nights when it got rough, it was no joke, right, it was some serious stuff went down with the rubber bullets, tear gas and all that stuff. But that’s one part of town, that’s at night, and most of it happened in August and a little resurgence, serious resurgence on Monday, I actually got pretty bad Monday, but during the daytime not a problem, most nights not a problem, most of the town not a problem. It really is no joke when you are in the right spot at the right time but otherwise it’s a normal town, people are doing normal things and people trying to kinda wrestle through the deeper issues that have been unearthed in this process to help make it a better town. I wonder did you sit down and talk to your staff about the situation and how you felt the library should respond or was your staff kind of onboard already and knew kind of how you felt and how the library was gonna respond? For the most part they were onboard already or at least they are going to go along depending on which staff person we are talking about some of them are very enthusiastic another were like, “Okay, I guess we will do this.” I didn’t sit down and give the pep talk or give a giant strategy session or anything like that what I did do is I identified a few things that needed to be said and said them. So we talked a bit about, as employees what can we say at the front desk, what conversations should avoid at the front desk? Have them all you want in the back room and then I’m delighted to have you do whatever you want outside the library but don’t start a fight with each other on the front desk, right? And we talked a bit about the need for the library to be a safe space for everybody and no matter what their politics or their race or their social class or anything else, so that kind of thing was important enough to say out loud and a few other things like that and lot of answering questions but I didn’t sit down and say, “Okay, here is our philosophy of librarianship.” I think they had already gotten what was important about that before Michael Brown was killed. And do you have, when the community comes in, are they wanting to talk about it with staff? For the most part, no, most people since… I only had about a month and some change of comparison time but it seems like since August people have been particularly respectful of the quiet space of the library, right. They come in and they seem to be happy to treat it as the quiet oasis space I think. So they haven’t been arguing with each other and they haven’t been talking about it really out loud or anything like that, there are conversations that happen but they are being respectful of other people around them. For the most part they are also not trying to engage in those conversations with staff on the desk, there are two of my staff who are very active in the protests and they are known by the people that are out there to protest. So every still often someone will start a conversation with them and they have to say, “No, no, no, wait until I go on my break” or something like that rather than have that conversation right there at the front desk but for the most part not a problem. 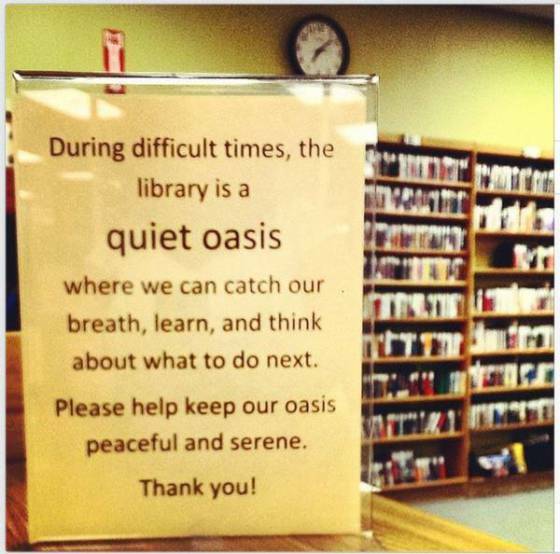 Like you said, they are respecting and I should say for people who don’t know I think everybody probably knows but you had a sign up saying, “That the library is a quiet oasis that you welcomed people in.” We’ll put a picture in the show notes. Did you have anybody directly respond to that like say, “Thank you for providing the space.” Or anything like that or would they just abide by it? In real life face-to-face I have had few people say it was a great sign and thank you for the sign. In the digital world I’m talking to people from California, New England and elsewhere, I’ve had great praise from all sides. Right and I mean that’s really, I mean, this is an extreme example but that’s really what libraries are all about. Yeah, yeah, I mean, a nexus for the community, a place to get together. And a place to get and to a place make yourself stronger, right. We provide information; we provide cultural literacy, ongoing education, serving as a nexus for the community, all the stuff, and story things in the communities and strengthening individuals within communities. I told some people on Twitter about that I was going to be talking to you so I asked if anybody had questions and somebody asked, if you have any advice for how you work with communities since I think most people agree that you are doing a great job, really embodying what libraries should be all about. Do you advice to other libraries that hopefully this won’t continue to happen in this kind of extreme thing? But if it should do you have advice for how other libraries should deal with it? The thing that has made it possible for me to… Well, all right, so my approach has been to say yes whenever possible, right. I decided early on that I really wanted to look back and regret saying yes too much rather than saying no too much. And I would say that, just be open to doing things differently in bigger and more complex ways than what you are used to and accept the fact that you are just gonna be really darn busy and that you can have a lot of things in the air at once. And not everything will be done perfectly, there are plenty of things that are slipped through my fingers but it’s really all about just saying, yes, yes, yes to all the ways you can help that makes sense for a library to do. They can say, you don’t necessarily have to come, like you are saying yes to ideas, you are not necessarily having to come up with all these ideas like I think, if I’m telling this correctly, the collaboration you did with the schools they came to you I think right and asked if they could use the space, is that right? Right, Carrie Pace came in; the school has just announced they were going to be closed for the entire week. And we are all wondering what to do about that night and we are trying to address how can I help, how can I help, how can I help when Carrie Pace came in and said, “If we provide a few teachers can you provide few tables?” So yes she’s the general of that, she started that whole thing and she is the center of that whole activity. My role was to jump up and say, “Actually, we can go bigger than that if you want to, we’ve got a big room, we’ve got a little room, we’ve got the children’s area, we can devote all of that to it and if you bring in more than a few teachers we will do more than a few things.” So and in that way we shape it, and then just to be there to consider all the different aspects as that program progressed. Part of my role was to kind of the, I will make it get as biggest I could still protecting my previous obligations. So I made sure that it got as big as it could while still keeping one part of the library kind of working normally so it didn’t overwhelm the entire library and drive people out. Right, because I believe you said before that the whole time you still had all your normal patrons coming in and doing their normal things, right. [Laughs] And you are also hosting an art show, can you talk about that? Sure, in August, I was approached by Freida Wheaton who is a gallery owner here in St. Louis, asked if we could, if we would play host to an art display of artists responding to the situation in Ferguson, right. So I said, I told her before we started, on the condition that whatever pieces come in there and they are not the kind of pieces that are gonna make people start fighting with each other right there in there, right looking at the bases and going blah-blah-blah and blah-blah-blah and back. Right, you don’t want to incite something. Exactly. I want challenging art but not “inciting-with-a-c” art, but insightful not inciting. Anyway, so I said yes, and it proved to be interesting, and kind of the one thing that has proved to be kinda politically troubled, complicated of what we have don,e because the art didn’t actually go up until mid October and we had a big opening ceremony and that kind of stuff but before the art went up, the Alliance of Black Art Galleries announced to the world that this was actually across 14 different venues including the city library, central, it’s a big old grand Carnegie building and a number of different universities and that kind of thing as well as art galleries. So it was a big deal 14 venues and we were gonna be the first to do an opening ceremony, kind of the center piece of it. And the name of the show was “Hands up, Don’t Shoot: Artists Respond.” So, I got complaints, about eight or so people very hot, very angry, who are just mad as heck. At the idea that as they put it, as they perceived it, the library was gonna play politics and be anti-police. So with each of these people I just said, “Okay, libraries…” I explained exactly what my thinking was, the rational, how that helps the library, cultural literacy, that it’s actually a wide-ranging art display with a number of different topics, don’t be so myopic about that – I didn’t say that, of course – but don’t be so myopic about the focus or make a bunch of presumptions. Right, exactly. And because I was really open and really frank about every little bit of what we are going on and why and what my rational was they all left kind of saying, “Well, you still did the wrong thing but I guess I understand why you did it,” right, and once the actual art was up, no problem. At least with transparency, they understand why you did it. And with day-to-day patrons complaining about fines or whatever or confidentiality rules or whatever is being able to explain the rationale behind the rule that there is an ethical base to it and a legal base to it or whatever is required, helpful. One of the great things that I think, looking for silver linings or these kinds of things, that you got a lot of attention and you got a lot of donations, the book donations I know Angie Manfredi was very instrumental in putting together wish lists on Powell’s. How did that come together? Did she just come to you with that idea and she already have the wish list made up or did she come to you or did she just kinda do it on her own, how that start? It started back in August in the aftermath of the original school, the week-long school thing we did. She basically contacted me on Twitter and said I would like to make a booklist of titles, and I said, “Yes.” And she did and she told all of her people to help the library by buying books and they did. We went through two lists at that time maybe three. And then whenever this last Tuesday, whenever the Grand Jury announcement was on Monday and the schools were closed Tuesday and so we had school here and that kicked into gear again and she, what she would do is she contacted me and said, “I put together this list and are these books okay with you?.” And I would look down the list and say, “Yes.” And then she would handle all the details and that’s been beautiful because she is a pro, she’s really good at selecting books in these areas. And what she did is—she made booklists that focus on civil rights history, civic engagement, recovering from trauma, and just diversity in books in general. And she has made a phenomenal list and we are gonna have one of, once we are done cataloging these books, we are gonna have one of the strongest collections in the state and in those areas. [Laughs] Yup, we still have almost a cart full left over from August and we are getting a huge influx of new books now from Angie’s work and from, Hope Through Stories, which is an attempt to get authors to send signed books of their own, their own signed books, to the library which is pretty a huge number of just brilliant, brilliant donations and some other efforts along those lines book drives essentially for the library. So yeah we have got far more than we can handle, I have been begging for help with cataloging, volunteer or paid, I am cool either way, at this point, “Oh, we just need to get these things done and into the collection.” Because we are, it’s just amazing how backlogged we are because I’m the only the full-time person. So our cataloger is retired and coming back part time, so she can’t spend crazy amounts of time on these donation books, she’s gotta do our incoming books first and then do the donation books when she has the chance. And I know the author John Green sent you some of his books and I think you got something from Scholastic. Yeah and so I mean part of what made our money donations have gone beyond all reason, we have gotten more $300,000 worth of financial donations which is really kind of staggering when you consider that our budget, yearly budget is $400,000 and our normal years’ donations is like $3,000. Are you gonna put those donations just into your regular collection or you making a special collection for them or? And some of them are fiction, I think too, right? Oh, yeah a lot of them, most of them probably are fiction at this point. So yeah, the donations that we are getting in the spirit of our recent efforts and that are even vaguely toward, if it’s obvious that has been given now because of response to what we are doing for Ferguson in this troubled time, then we put it into the Unity Collection. I’m sure you’re in the middle of doing all this planning but do you have some ideas for what you wanna do with the monetary donations? I’ve got plans, we are gonna have a special board meeting on Monday to pin down, I know what I wanna pitch but I don’t know how it’s going to come out in the end. What I wanna do is, the main thing I wanna do, the number one thing I wanna do, is get a children/programming librarian because we need a second librarian, something fierce, and someone who is dedicated to programming, who will do a whole lot better and do a lot more, be a quantum increase in the ability of us to respond to the community because right now I’m just kind of doing things, throwing things together when I can between director duties and having a second person who can really focus on that will make a big difference so that’s the main thing. We also need to make sure that some stays in our account because you’ve got a budget as small as ours and as tightly as we run, there is a point where the bank account hits a low every year before the tax money starts coming in it kind of bottoms out, it bottoms out lower than I’d like or some of it just needs to stay in there. And some of them need to go toward capital improvements that are way, way, way overdue, our carpet is abysmal has holes, stains, rips, patchy places where they have moved shelves and stuff and then patched it with a different color carpet entirely. A half-attempt to replace the carpet that only got about 10 feet from the door that kind of thing and we have the HVAC units that are from the 1980s and we have lots of stuff we could do just because we have had a tight budget for a long time now and now it’s a chance to kind of do some of the things that we keep putting off, putting off, putting off, putting off. That will be the board’s call really in the end; I will guide the board but the board makes decisions on the big expenditures like that. Can you tell me about the Healing Kits? Sure, a leadership class at a local community college, a handful of students came to me because they want to us to do something for their class project to help the library and two things came out of that. One was that I taught a few of them how to sign up people for a library card and they went to the corners of Ferguson that are furthest away from the the library like the Canfield Green area where Mike Brown lived, and went door-to-door trying to sign people up for library cards. And the other thing was one of them had an idea of something about… Well, I can’t remember the original germ of the idea but what I developed it into, what we developed into, was the Healing Kit which is a backpack with library’s logo on it, a couple of books about emotional healing and coping, kid’s books, picture books, a stuffed animal, information about counseling options in the area, some worksheets about emotions, working through emotions, and a sheet that says what all supposed to be in there, and the idea is that a family or kid checks a bag out, they keep it for two weeks and when they bring it back they keep all the papers and the stuffed animal, the information and the toy, and give us back the bag and the books. We will put in a new stuffed animal and new papers and give it to the next kid. It’s a great idea, I mean, it can be a big thing, it sounds like something that could be a very big help. Right, right any parents who approached in the right frame of mind could get a lot of good out of that little bag. One of the things you did to get the word out about what you have been doing and answer some questions, I assume you have been getting tons of questions from media and from all kinds of other people is you did a Reddit “AMA”, Ask Me Anything. Were you already a Redditor, were you already active on Reddit before this? I dipped in and out of Reddit with my home account. It’s something that I would come wandering back to every so often and then I’d get lost in Reddit for a while and then get back out again. For this though I made an account through the library’s email so to be clear who I was and why I was there and essentially someone, a friend of mine pointed out that there were threads on Reddit where they are talking about the library and I went over there and saw those threads and I made an account with the library’s email and I made a couple of responses and I said, “Would there would be any interest in me doing an AMA?” And few people said, “Yes.” So I said, “OkayI guess I will, and I did.” It was a really good opportunity to get a lot of ideas out, things that have been kind of bubbling around in my head and no one happened to ask me during the various media interviews and so they have been kind of lurking in the back of my mind and it was good to express them and it was good to be very clear and it was good to see how some of the ways that people interpret things and kind of some of the darker edge that came sneaking around at the end in some areas of the Reddit where they ask crazy vaguely racist questions and that kind of thing. It was just a nice cross-section of humanity and most of them asking really good questions and a chance to kind of really take my time and communicate in text which I do much better, I do much better in text than I do face-to-face or by interview like this. It was great that you got to answer sort of do library outreach just in the general sense because people had some, “What do libraries do?” kind of questions and “What books are popular in libraries?” kind of things. So it was good just in general library outreach too. Sure. Well, all through this, whenever I could find an opportunity I have tried to like support libraries as an institution and try to make it clear that we are a normal library, right. So one of the things that’s kind of been a sub-theme of a lot of the coverage is kind of the idea that, “What an amazing library! How are they doing these incredible things?” And I’m like, “We are not, right, we are doing what libraries do. We are in a dramatic circumstance and we are doing things a little bigger here and there, the school thing is a little bigger than I might have done otherwise. But what we are doing is exactly what libraries do everyday. I mean this is what libraries do.” So whenever I get a chance to express that concept that idea I do because I think that libraries as an institutions ought to be valued as highly as we can otherwise I wouldn’t be here. [Chuckle] Right. Well, everybody I talk to about it feels the same as me you are being a big inspiration to everybody, you are doing a great job of serving your community that’s really what like you said I mean that’s what libraries are all about, you are being a great example of that to the world. So thank you for being that great example for everybody. If people wanna get in touch with you about donations or just ask questions what’s the best way for them to do that? Probably best is by email. sbonner, S-B-O-N-N-E-R @fergusonlibrary.net, F-E-R-G-U-S-O-N, library.net. You can also call the library; you wanna call the main number and ask for me or call my office because I’m never in my office. The number is 314-521-4820, and I’m on Twitter, the library is on Twitter as @fergusonlibrary and I’m on Twitter as @scottybonner, S-C-O-T-T-Y Bonner, B-O-N-N-E-R. So all those are good, I try to be as kinda wide open in public and open about things as I can. So feel free to ask whatever, anyone. We can even ask you about role playing games. [Laughs] Yeah, yeah, yeah, and yeah. I don’t have an active group right now, by golly, I wish I did but I keep trying to work out some way in my schedule that I can started I roleplaying game group here at the library. And the kids, the teenagers or some of our teenagers that are in the team council group, have told me they want me to do that, they wanna try out roleplaying games, but it’s just a matter of, golly, how can I carve out another four hours every two weeks to play. Right, you need to build a time machine. If you’d like to learn more about the show or listen to past episodes you can visit circulatingideas.com, or follow us on Twitter @circideas. We are also on Tumblr at circulatingideas.tumblr.com or you can like us on Facebook at facebook.com/circulatingideas. If you have comments, questions, or suggestions for future interviews you can drop us a line at mail@circulatingideas.com. Music is by Pamela Klicka. Thank you for listening, and keep circulating the ideas. I was trying to read over some of the other stuff that I have seen with you and I’m gonna try not to ask you all the exact same questions again but I’m sure we will cover some of the same stuff. So I don’t get to fall back on my now-memorized favorite answers?